There’s nothing brighter and fresher than the colorful shades of citrus: think lemons, limes, grapefruit, oranges and tangerines. We love the idea of turning these fresh-squeezed hues into a wedding palette that’ll really pop for a summer wedding! Set the tone with citrus inspired invites, like these cheerful cards by Lola Lee Invitations. They are the perfect way to brighten up the mailboxes of your family and friends. Going with a citrus theme is easy and can be affordable too. 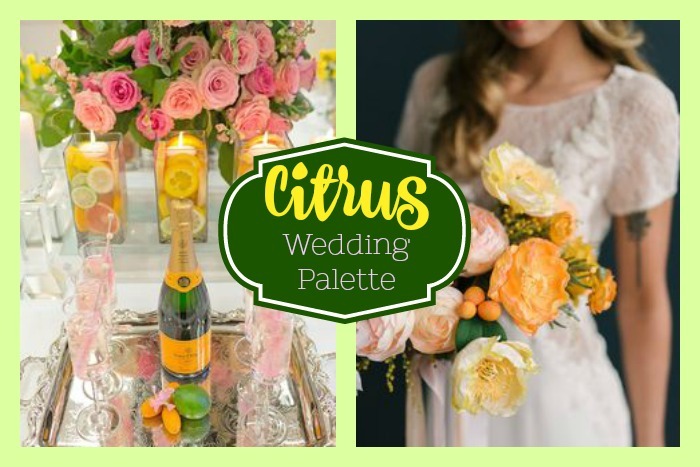 One way to save with citrus: Load up on piles of the summery fruit to use for decor and floral arrangements at the ceremony and reception! And, use masses of slices for dressing up your drink station! Plain ‘ole water looks pretty fancy with three hundred orange slices crammed in a pretty glass container. Plus the delicious lemony, limey, orangey scents will fill the air. Another idea we love is to use scooped out citrus fruits for delightful desert serving bowls. Like these refreshing looking Raspberry Sorbets in lemon halves. Whole and sliced fruit in tall glass cylinders of water work well as a modern substitute for more traditional floral arrangements. Even if you are using flowers, (which you most likely are!) the addition of colorful fruit adds majorly to the appeal! Brighten your guests’ senses with refreshing IZZE Sparkling Juices. Our fave – Clementine. This sharp, summery tongue-tickler has just the right amount of bubbles to wake up everyone’s taste buds. We love the vibrant, citrus-themed table setting by Bellenza, below, which perfectly captures a summertime feel with fruit-inspired table decorations. Visit their site for many cool ideas on how to incorporate and layer the tropical shades to make your wedding tables shine! Another way to reinforce the summery theme is by wearing a luxurious, citrus-scented perfume. Try Jo Malone’s London Orange Blossom Cologne available from Neiman Marcus for $65, which is described thusly, “the scent of clementine leaves in the morning dew sparkles above a heart of orange blossom and water lily, transporting the wearer to a garden oasis.” Ummm, yeah, okay that sounds heavenly!!! Wear it for the wedding and anytime you spritz it on in the future it will conjure up wonderful memories of your happiest day. For a romantic wedding day look for the bride, we suggest this lace stunner from Abree. Even though it features long sleeves, the sheer illusion fabric is lightweight and well suited for warm weather. We can picture this modern wedding dress sparkling in a citrus setting on a sun-kissed bride. Bountiful bouquets bloom with beauty in yellow, orange and pink with pops of green…all citrus colors. Add in your choice of fruit to make the bouquets even more luscious! And, how cute are the tiny, citrusy boutonnieres? A crate full of succulents, florals and oranges is rustic as well as stunning! Tropical flowers with touches of citrus and greenery are so pretty on these simple white and naked cakes. How pretty is the simple round cake with slices of orange, lemon and lime? Best of all, going with a sweet, simple citrus theme is celebrating nature at its finest.